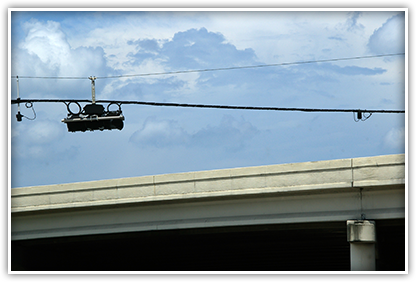 The I-4 Ultimate team knows that effective maintenance of traffic incorporates safe, reliable and continuous traffic flow. We have developed a comprehensive traffic management plan that addresses the complexity of the I-4 Ultimate project while also minimizing impacts to the traveling public. Intelligent transportation systems and the Regional Traffic Management Center are playing a key role in managing traffic, and you can learn more about these efforts in this section. 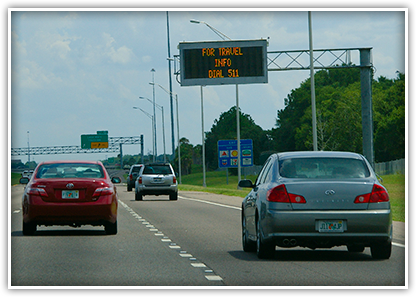 CCTV cameras and vehicle detector sensors on I-4 and other arterial state roads provide information via highway message boards. Intelligent Transportation Systems (ITS) bring together many technologies to improve traffic conditions on Florida’s interstates and other major highways. ITS integrates a broad range of wireless and hard-wired communications devices, including live traffic cameras, roadside sensors and dynamic message signs. ITS, operated through regional traffic management centers, helps monitor and manage traffic flow, reduce congestion and provide alternate routes to travelers. Florida’s statewide ITS program, SunGuide, allows centers around the state to communicate with one another in times of emergency and heavy traffic. The real-time ITS information collected is used by law enforcement, Road Rangers and emergency responders to respond to incidents and determine how best to improve traffic flow. The existing ITS features, including hundreds of CCTV cameras, will be maintained and operational at all times throughout I-4 construction. Hundreds of closed-circuit television cameras and vehicle detector sensors on I-4 and other arterial state roads provide information via highway message boards and Florida 511, which will be especially beneficial to motorists during the I-4 Ultimate construction project. Knowing what to expect when driving through the work zone allows drivers to make informed decisions about their travel options. Coordination with the RTMC is critical to providing safe, reliable and continuous travel. FDOT District Five is the fastest growing district in the state of Florida, covering Brevard, Flagler, Lake, Marion, Orange, Osceola, Seminole, Sumter and Volusia counties and nearly 9,000 square miles. The District’s 3.6 million residents log nearly 55.6 million vehicle miles traveled daily on 2,100 centerline miles and 7,446 lane miles. District Five also is served by five transit authorities, five rail lines, one deep water port and more than 160 public and private airports. You might be wondering how the District keeps all that traffic moving and provides motorists with reliable traveler information. With a regional traffic management center (RTMC). 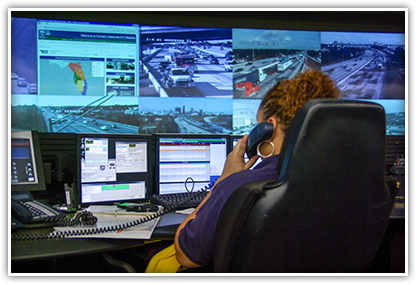 District Five’s RTMC, located on Semoran Boulevard in Orlando, is the regional hub for the Central Florida Intelligent Transportation Systems (ITS), which includes operation of hundreds of CCTV cameras, dynamic message signs and vehicle detector sensors. In operation 24 hours a day, seven days a week, the RTMC is also responsible for information dissemination to 511, Road Rangers service patrol dispatch, connected vehicle deployment and variable speed limit signs. The RTMC is a high-tech facility that monitors traffic and is a key component in our project traffic control plans. 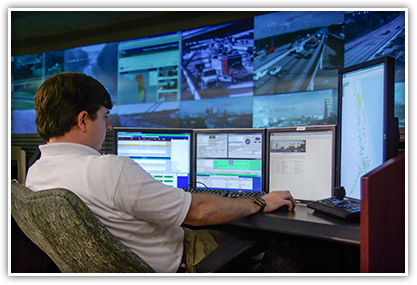 Featuring a multi-screen video wall with eight workstations running the SunGuide ITS software, the RTMC is a state-of-the-art facility that acts as a command post for monitoring traffic. The District Five RTMC also works closely with incident responders throughout the District, and its co-location with the Florida Highway Patrol facilitates agency coordination during incident management. This partnership allows for the quick and safe clearance of traffic incidents that affect our highways and provides drivers with up-to-the-minute traffic reports that keep them moving. For more information about the RTMC and its role in traffic management, contact Jeremy Dilmore at Jeremy.Dilmore@dot.state.fl.us.